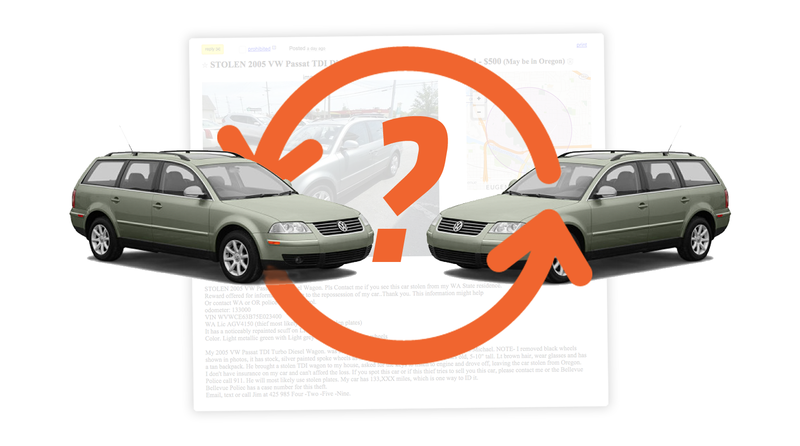 Who’s Behind This Bizarre Chain Of Craigslist Volkswagen Passat TDI Wagon Thefts? By now we all know not to expect too much logic or reason from Craigslist. We know Craigslist is a deviant subset of humanity, sometimes an ideal place to find beater cars or dusty mid-’70s pong games, sometimes a terrifying hive of vice and exposed genitalia. This time, it’s a place where a strange serial Volkswagen Passat TDI wagon thief seems to be active. “My 2005 VW Passat TDI Turbo Diesel Wagon. was stolen tonight by a Craigslist “buyer” calling himself Michael. NOTE- I removed black wheels shown in photos, it has stock, silver painted spoke wheels as shown in 1 photo. He is about 30 years old, 5-10" tall. Lt brown hair, wear glasses and has a tan backpack. He brought a stolen TDI wagon to my house, asked for the keys to listen to engine and drove off, leaving the car stolen from Oregon. So, if I’m understanding this correctly, a guy named Michael shows up to an address in Washington state, driving a VW Passat TDI wagon, registered in Oregon, to look at another VW Passat TDI wagon for sale. Michael asks for the keys to the 2005 Passat to hear the engine, and, while in the car, takes off with it, stealing the 2005 Passat from the owner, and leaving the Passat with the Oregon plates, which also turns out to have been stolen. So, whoever this guy is, he’s just swapped out one stolen Passat TDI wagon for another. Why? This can’t just be a regular car theft—he already had a stolen car, and it must have been the stolen car he wanted, because he then stole another car of the exact same kind. Maybe the guy is trying to make his way across country by stealing Passat TDI wagons, in some perverse record-setting attempt? Is this some kind of mind-meltingly complex grift related to the TDI buyback? I wonder if the Passat-klepto even thinks that he stole that 2005 Passat, since he left another Passat in its place? Anyway, if you happen to see anything or know anything about this puzzle, then call the number in the ad or the Bellevue, Washington police deprtment. Then email me and tell me what the hell is going on with this, because I’m really curious. What is it with passats and craigslist weirdness?